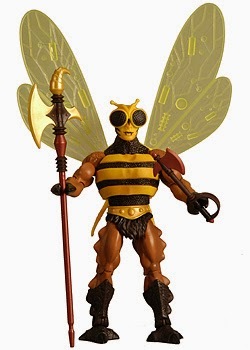 Tzzzzt zzz zzTTTzz is the noble leader of Eternia’s Bee People, a colony of humanoid bees. As leader of the Bee People, Tzzzzt zzz zzTTTzz is the main representative for his race and enjoys a good relationship with King Randor. He often speaks with the King regarding matters of urgency. As a Heroic Warrior, he has a lot of support and has taken Buzz-Off as a nick name. His greatest power is his ability to fly, which allows him to scout over large territories and report back to his allies. He occasionally acts as a spy possessing X-Ray vision via his goggles. Buzz-Off's antennae are highly sensitive and can often sense danger. He is mostly paired with Mekaneck on missions.